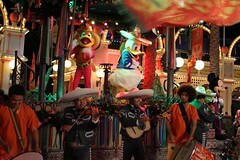 We had a great time previewing the newest celebration at the Disneyland Resort – “Disney ¡Viva Navidad!” Guests will enjoy this festive holiday presentation Nov. 15 2013 through Jan. 6, 2014 in Disney California Adventure Park. 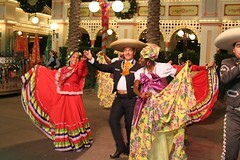 “Disney ¡Viva Navidad!” is a merry celebration inspired by the warmth and joyous spirit of the Latino culture, filled with holiday traditions, jubilant dancing and exciting music. 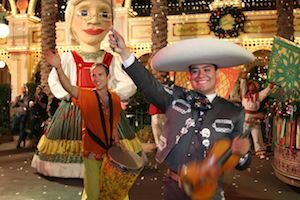 Based in and around the Paradise Garden area of Disney California Adventure, the special activities include crafts and face-painting for children, live Latino music, dance lessons, holiday foods, the “Disney ¡Viva Navidad! Street Party” and, of course, appearances by some popular Disney characters. 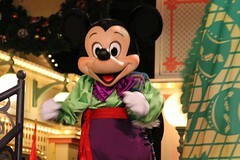 The exciting “Disney ¡Viva Navidad! Street Party” takes over Paradise Garden several times a day, featuring the Three Caballeros on a festive holiday float, Mickey Mouse and Minnie Mouse transported on colorfully decorated street tricycles, flag-bearers carrying papel picado banners, Mexican folklorico dancers, samba dancers and drummers, plus giant “Mojiganga” puppets, including Santa Claus and Mrs. Claus. 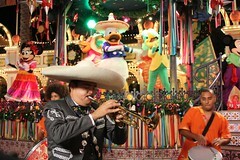 At the Paradise Garden bandstand, guests may enjoy performances by traditional Mariachi, Norteño, and other regional music groups. Also at Paradise Garden, community music and folklorico troupes will perform throughout the day. “Disney ¡Viva Navidad!” guests will find opportunities to enjoy fun arts and crafts, storytelling and face-painting, and they may also discover a selection of unique merchandise in the area. Dining locations in Paradise Garden add an array of popular Mexican food options. Menus will feature Mexican dishes that are often served for the holidays, such as pozole (hearty stew), chicken mole drumettes, pescado (fish) Veracruzano, champurrado (Mexican-style hot chocolate), sweet tamales, torta al pastor (pork sandwich), buñuelos (deep-fried sweet treat) and choco flan. 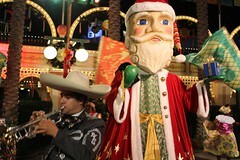 The grand finale of “Disney ¡Viva Navidad!” will be the special celebration of Three Kings Day (Dia de los Reyes) Jan. 3 through 6, 2014 in Paradise Garden. Holiday treats will include traditional Rosca de Reyes bread. PreviousFamily | SF Zoo Playground Re-opens!